Maureen O’Carroll: A Musical Memoir of an Irish Immigrant Childhood vividly brings to life growing up in a large, quirky but ambitious, Irish immigrant family during the Depression and War time in Australia. 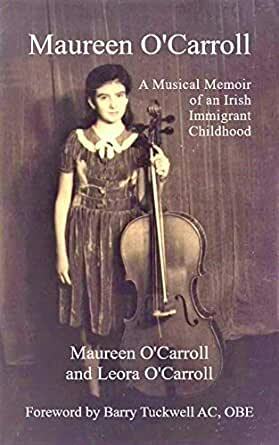 This enchanting memoir is told through the eyes of the middle child of the ten O’Carroll children, mischievous Maureen, who went on to become an acclaimed cellist. After years of periodic imprisonment in Ireland for their fight for independence, Maureen’s parents immigrated to Sydney, Australia with their large family in 1930. The patriarch, John O’Carroll, sets up in the storefront of their Balmain terrace house a barbershop, The Anchor Hairdressing Salon, which becomes a hub of activity for the locals. Maureen’s mother, May Gahan O’Carroll, an honored participant in the 1916 Irish Uprising, supplements the family’s income with her fortune-telling gifts. Reversing the letters of her last name, she calls herself “Madame Llarraco”. Throughout this colorful memoir infused with Irish history, local politics, Catholicism and the humorous struggles of Depression-era life, music remains a vital theme. It is instrumental in the family rising above their hard circumstances to achieve a better life. Remarkably, all ten children were musicians. This evocative memoir, written by the mother-daughter team of Maureen O’Carroll and Leora O’Carroll, is a beautiful, poignant and entertaining story of family, adaption and overcoming tough times to survive - and indeed thrive. "This is more than a charming Irish memoir. The voice of a spirited young girl sets the perfect tone to deliver Irish history, the determination of a family to make their way into another country, and the importance of music." "The duo’s commendable, uncluttered style carries the narrative easily along, as they choose specifically poignant details, which make for engaging read." I really enjoyed this. It is sensitively written and gives a wonderful insight into a special lady who I had the privilege of meeting. Thank you. I really enjoyed reading this book, with its evocative rendering of the life of an immigrant Irish family in Australia. The portraits of the author's grandparents, who fought for Irish independence, were especially poignant. The book is such an enjoyable read that one wants to learn more about this family. I was charmed by this lovely little book, reminiscent of Jill Ker-Conway’s “Road from Coorain” and Laura Ingalls Wilder’s “Little House on the Prairie, made all the lovelier by its musical background. I loved the era and the writing really took you there. Thoroughly enjoyed reading about this family’s journey from Ireland to Australia and on to today. A beautiful story of family and love and he music that binds us all together. A beautiful memoir, both poignant and laugh out loud funny. Like peering through a keyhole back in time through the eyes of a child. I highly recommend this gem. You won't be able to put it down. Easy read & beautifully captures a time gone passed.